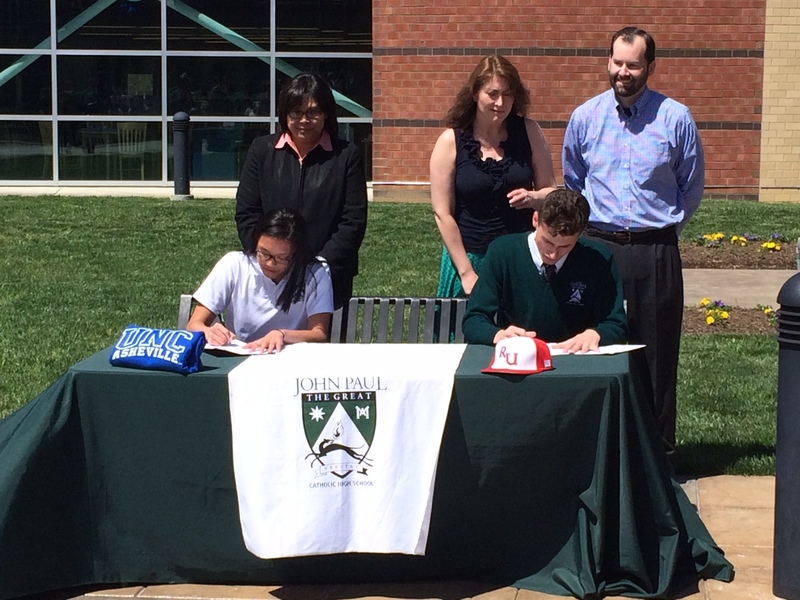 After years of hard work, countless miles logged, a vast amount of hurdles cleared, and a completed college search, seniors Katherine Duquiatan and Sean Tully recently signed their Division I National Letters of Intent. Katherine will be doing track for the University of North Carolina at Asheville, and Sean will be running cross country for Radford University. This was the third signing ceremony John Paul has witnessed, following Kelly Donovan’s (American University for soccer) in 2012 and fellow member of 2015 Josh Cox’s this year. “It’s an amazing feeling to be officially doing a sport in college. Ever since I started getting into sports in middle school I knew I wanted to go D1. I just never knew for what sport so it’s great to finally see that my hard work finally paid off,” Duquiatan said following her signing ceremony. “Running has become one of my biggest passions during high school. I’m glad with my hard work and the help of my coaches I’ve been able to take it to the next level,” said Tully. He will be on scholarship for cross country at the southern Virginia school, but he will also participate in track and field. Recently, Tully broke the school-record in the 1600m run (about one mile) with a time of 4:29, and he the proceeded to break his own school-record for the 3200m with a time of 9:41. Both Duquiatan and Tully are in the process of completing their spring track season here at John Paul. A highlight of the team’s remaining meets is Catholic States on May 9, an event that will be held at home for the first time in school history. The boys team is the reigning Catholic State champions, having also won the meet in 2012. 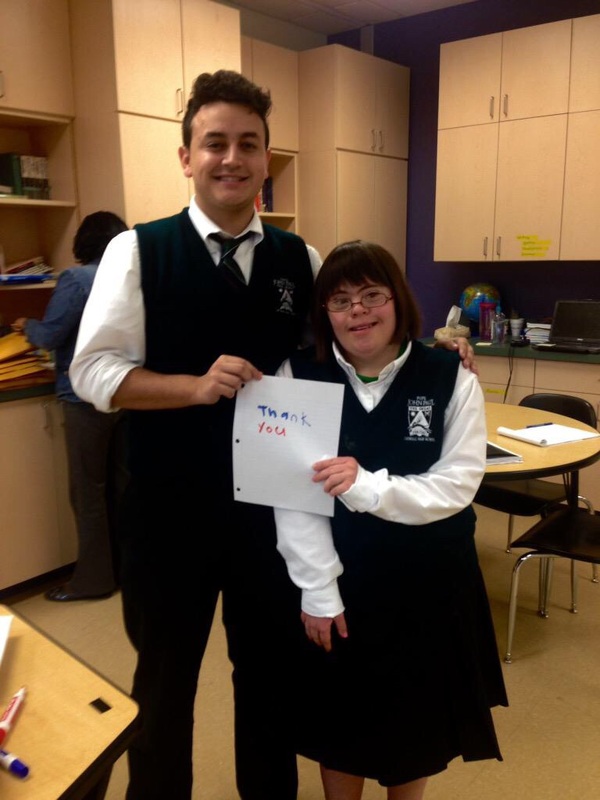 Congratulations again to Katherine and Sean on the culmination of their hard work over their years in high school. We wish them all the best as they pursue their talents at the next level. In the final basketball game of the season on February 19th, the Wolves were set to square off at home against the Cadets of Benedictine. The visitors entered the game ranked #7 in the latest VISAA poll. However, the Wolves were accustomed to stiff competition at home and had already taken down powerhouse Clinton Christian as well as Episcopal. It was not only the final home game of the season, but it was also senior night for the lone senior member of the team, Xayvin Johnson. A key member of the squad, Johnson has been a vocal leader in controlling games all season long, and it was time to honor him before his final high school game. A transfer his junior year, this was his second season in a Wolves uniform. The game got off to a very slow start for John Paul, as the Cadets road a wave of suffocating defense and excellent shooting to surge to a 21-11 lead by the end of the first quarter. The Wolves tried to find a way to stop the bleeding but the Cadets had a clear size advantage. Then in the second quarter, after at one point facing a 31-16 deficit, the tide turned. The light went on and John Paul went on a tear, scoring basket after basket to make it a competitive game. All of a sudden, the noise from the crowd had escalated and the Wolves had taken over the lead. After being down 15, they took a 40-37 lead into halftime. Despite grabbing the lead, the Wolves weren’t able to put the game away in the third quarter, and they entered the final quarter of play locked with the Cadets in a 51-51 draw. The game remained close up until the very end, when John Paul secured just a slight bit of breathing room as the time wound down. Behind 21 points, including five threes, from sophomore Brandon Edmonds, 17 points from Johnson, and 16 points from junior Chauncey Wallace, the Wolves outlasted Benedictine by a final score of 76-70. “It was heart breaking playing in my final game because I knew I would never get to play in front of our amazing fans again, but on the bright side it felt amazing to go out on a win because I knew I would never get to put that John Paul uniform on again. I’m thankful for everyone who made that night special for especially my teammates, the coaches, and the fans,” said Johnson after the game. The team finished the season with a 10-16 record including home victories over, as mentioned, Clinton Christian and Episcopal, as well as rival Bishop Ireton. After only graduating one senior, the team will look to improve and have a strong 2015-2016 season.